So as we all know, artichokes (carciofi) were the winning ingredient for the "Mamma Meets The Cucina" Food Challenge. You voted and we heard ya loud and clear!!! So what you are about to read is the result of long hours of inventing and preparing the (hopefully) WINNING recipes for this challenge:) we both know we've got some hefty competition - but it's all in good fun....for now. This is a traditional Italian dish with the addition of artichoke hearts, which makes for great flavor and texture. Although this recipe calls for chicken cutlets, it would also work well with veal cutlets, flounder or tilapia. 1. Piccata is fairly quick and easy to make. As long as you stay on top of your timing, you'll end up with a perfect dish. 2. Whenever you are using wine to cook with (you will be using white wine for this dish), never use anything less in quality than you would drink or serve to guests. Better tasting ingredients make for better tasting dishes! In a large pan heat 4 tablespoons olive oil, add 2 tablespoons butter. Add cutlets, cook 3 minutes each side. Add 1/3 cup white wine, 1/3 cup chicken broth and juice from lemon, lower heat, let simmer for 5 minutes. Add 2 tablespoons capers and 1 small jar artichoke hearts. Let simmer for 1-2 minutes. .....or if you want to sound really Italian, Pollo con Carciofi e Pomodori! The roasted taste of the artichokes and the tomatoes is what makes this dish. Don't skip that step...and the creamy sauce, though somehwat of an indulgence - is so worth it because it's the perfect, rich finish to the chicken....I'd serve this with a green salad tossed with none other than - artichoke hearts! Place quartered tomatoes and artichoke hearts on a baking sheet. Drizzle generously with extra virgin olive oil and season with 1 tsp Italian Seasoning, kosher salt and black pepper (enough to coat). Roast in the oven (under the broiler) for about 5 minutes, or until the vegis get dark and crispy. While these are cooking, make pockets a pocket in each of your chicken breasts. (NOTE: this is much different than butterflying the breasts. Simply cut a slit in the middle, leaving the back and sides of the breast intact. This creates a pocket for your stuffing to fill. Roughly chop the roasted artichoke hearts and tomatoes. Stuff the pockets of the breasts generously with HALF of the chopped veggie mixture. Season the outside of the breasts with salt and pepper. Saute up some of that garlic in the e.v.o.o. As soon as they start to get golden, add the chicken and brown on each side, flipping them with EXTRA CARE so as to keep the filling inside:) Once browned, remove from the pan and place the breasts in a warm oven (350 degrees for 10 minutes or so) to finish cooking. 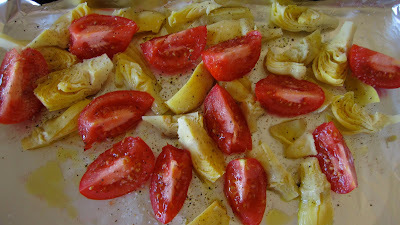 In the meantime, add the remaining roasted artichokes & tomatoes mixture to the pan. Saute briefly, then deglaze the pan with the white wine. Cook on med-high until reduced by about half (and the alcohol cooks out) and then add the heavy cream. Stir in some of the grated cheese and the rest of the Italian seasoning. Simmer until thickened, stirring occasionally. Add the chicken back into the sauce to heat everything through and meld all the flavors. NOW it's time to vote again! Use the poll on each blog's sidebar or the Cucina Domenico Facebook Group Page to cast your vote for which recipe YOU think should be the winner!